Working with a contractor can be challenging. This is particularly a true statement if you don’t do your homework prior to hiring him or her. However, if you do your upfront homework before hiring your contractor, you have at least a 50/50 shot of having a successful outcome with your home remodeling or construction project. I say 50/50 chance, because you represent half of the equation. How you conduct yourself with your contractor plays heavily on how smoothly your home remodeling project goes. Described below are 10 tips for working with a contractor to ensure your home remodeling project goes smoothly, and stays on time and budget. 1) Know what work you want done and how much of a budget you have to work with. 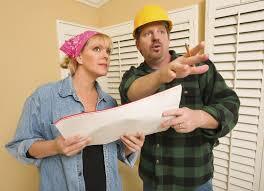 More specifically plan your home remodeling project out thoroughly. When you interview potential contractors be prepared to show them detailed sketches or blue prints. Also, make sure your plans include types of materials you plan to use in the project and a rough idea of their costs. 2) Compile a list of potential contractors. Talk to your family, friends and neighbors to see if they can recommend any to you. Also look online to find contractors in your local area. Even consider using a national contractor referral service who maintains databases of screened contractors. The service is free to you and there are no obligations. Simply go online, fill out one of their forms applicable to your particular project type, and a few local contractors in your area associated with the service will contact you. Again, you are under no obligation to meet with them or hire any of them. 3) Make sure to obtain at least three contractor bids for your project so that that you can get a fairly accurate estimate of what the project will cost you. Don’t simply select the lowest bidder. Make sure you understand every detail of each contractor bid, paying particular attention to the materials they are specifying for the project. 4) Check contractor references. Make sure contractors that you interview provide you with a list of references and check at least three references out for each contractor you are considering. Also, check with your state and the local Better Business Bureau to see if they are properly licensed, insured, and that there are no outstanding complaints or issues with them. 5) Make sure you get a signed written contract with the contractor you select. It should spell out a complete description of the work to be performed, the materials to be used and the total cost of the project. It should also include a timeline of how long their work will take and a payment schedule. Moreover, it should include language about change orders and breach of contract penalties. Listed below are the key items that should be in the contract. Avoid hourly contractor rates, time and material bids, or cost plus bids. Insist upon fixed cost bids. Also, be wary about initial deposits of greater than 15% of the total contract price. Moreover, make sure installment payments are tied to satisfactory inspections being completed by the local building inspector or you, rather than just the contractor saying they’ve completed the project, or a phase of it. 6) All work changes should be made in writing and the cost impact of each should be signed off by both the contractor and yourself. 7) Don’t stand over the contractor’s shoulder all day on the jobsite. In addition, make sure you keep your children and pets away from the work area. This creates distractions and risks for the contractor and you. 8) Inspect the contractor’s work daily, preferably at either the end of the day after he/she has left or early in the morning before he/she arrives. Bring your quality issues/concerns to the contractor’s attention as soon as you spot them. 9) Pay your contractor directly and on time for work performed, and that meets inspection. Always pay by check. Not cash. 10) Lastly, show a little kindness to your contractor during the home remodeling project. Bring him/her some donuts and coffee one morning, or show them some type of appreciation along the way for their efforts. It will pay off in spades in terms of creating a friendlier, yet professional, working relationship. For more help on building a home or home addition and working with contractors, see HomeAdditionPlus.com’s Home Addition Bid Sheets. Our Home Addition Bid Sheets provide you with the knowledge and information on how to plan a home building project, and what to look for when hiring contractors. They also include detailed cost breakdown tables and spreadsheets for estimating your own new home construction building costs.